Lopez, M. E. (2014). Combined in situ Hybridization/Immunohistochemistry (ISH/IH) on Free-floating Vibratome Tissue Sections. Bio-protocol 4(18): e1243. DOI: 10.21769/BioProtoc.1243. In situ hybridization and immunostaining are common techniques for localizing gene expression, the mRNA and protein respectively, within tissues. Both techniques can be applied to tissue sections to achieve similar goals, but in some cases, it is necessary to use them together. For example, complement C1q is a secreted protein complex that can target the innate immune response during inflammation. Complement has been found to be elevated early and before severe neurodegeneration in several disease models. Thus, complement may serve as an important marker for disease progression and may contribute to the pathology under certain conditions. Since complement is a secreted complex, immunostaining for C1q does not necessarily reveal where compliment is produced. In situ hybridization for complement components, C1q a, b, or c mRNA, is ideal to mark complement producing cells in tissue. In situ hybridization can be coupled with cell-type-specific immunostaining for accurate identification of the cell types involved. Protein localization and mRNA localization together can reveal details as to the relationship between complement producing and complement target cells within disease tissues. Here we outline the steps for combined in situ hybridization and immunostaining on the same tissue section. The protocol outlined here has been designed for detection of complement C1q in neurons and microglia in the mouse brain. Provided here are two approaches for combined ISH/IH. In the 1st example, in situ hybridization of C1q mRNA is performed together with fluorescent detection of Purkinje neuron cell bodies using Calbindin-D28K antibody. In the 2nd example, C1q mRNA in situ is performed together with 3,3’-diaminobenzidine (DAB) detection of microglia using CD68 antibody. Please note that modifications to the protocol may be needed for the use of distinct probes and antibodies, as well as alternate tissue-processing methods that are not specified herein. For appropriate examples of procedure results, please see images published in Lopez et al.. (2012). The approach for dual immunostaining of protein and RNA in situ hybridization is sequential. The method to be performed first depends on whether the immune epitope can survive the in situ hybridization conditions. The polyclonal antibody against Calbindin-D28K, a Purkinje neuron-specific marker in the cerebellum, can be applied after C1q mRNA probe in situ hybridization. Thus, the immunostaining procedure for D28K can be performed after in situ hybridization. However, the monoclonal antibody against CD68, a microglial marker, cannot. Therefore, the immunostaining procedure for CD68 needs to be performed prior to in situ hybridization. Both processes are outlined. Isolate whole brain immediately from euthanized mouse and immerse in freshly prepared PFA. Incubate overnight at 4 °C nutating [for a standard mouse brain isolation procedure please refer to Stevens et al. (2007)]. Wash fixed brains twice for 5-10 min each in RNase free 5x SSC buffer to remove excess PFA. Meanwhile, clean vibratome reservoir and blade holder with RNaseZAP and rinse with RNase free water in an effort to remove any RNases; operate with new blade. Vibratome section in RNase free 5x SSC buffer, 50 µm each section. Note: 5x SSC can be chilled while sectioning with vibratome to reduce potential RNase activity. We have not found this to be necessary but a precaution. Also, agarose embedding of the tissue for sectioning can be performed but is not essential. Transfer vibratome sections with sterile tweezers or brush to either a 1.5 ml or a 5 ml Eppendorf tube filled with 5x SSC buffer. Size of tube and volume used for incubating and washing will depend on amount of tissue sections. A 15 ml conical may also be appropriate. For a 1.5 ml tube washing and incubating are performed using 1 ml volumes. Note: Allow about 90% of total volume of liquid to be transferred between washes. For a 1.5 ml tube that would mean that free-floating tissue sections should fall and accumulate below the 100 μl mark so that 900 μl can be easily pipetted off and replaced. This approach should be adapted to greater volume tubes if used. Replace 50% of the 5x SSC buffer with Hybe and nutate for 5 min. Then allow sections to settle. Replace 90% of the supernatant with Hybe and nutate at 60 °C for ~10 min or more, until ready to add probe. Meanwhile, add 200 ng of purified DIG-labeled RNA probe per ml of Hybe to be used. Heat to 80 °C for 5 min to denature RNA probe into Hybe. Remove as much of the hybridization solution from the samples as possible and replace with Hybe with probe from step A8. Note: To conserve on probe and Hybe solution, samples can be incubated standing, without mixing, rotating or nutating, in the least amount of liquid needed to cover the sample, e.g. 100 μl if a 1.5 ml Eppendorf tube is used. Hybridize at 60 °C for at least 16 h nutating. Note: Again, if using low volumes of Hybe w/probe to cover tissue sections, mixing while hybridizing is not necessary. The probe should diffuse adequately at high temperature and during long 16 h or more incubation periods. After hybridization, replace or dilute hybridization solution on samples with Hybe without probe and incubate at 60 °C for 15 min nutating. Note: Hybe and wash 1 and 2 buffers are usually prewarmed to 60 °C, but protocol has been successfully performed without heating the buffers for this and the following wash steps. Wash 2x with wash 1 at 60 °C for 15 min nutating. Wash 2x with wash 2 at 60 °C for 15 min nutating. Replace wash 2 with block and incubate at room temp for 10 min. Replace block again to dilute wash 2 further. Incubate hybridized sections at 4 °C overnight in fresh block containing 1: 1,000 dilution of anti-Digoxigenin-AP, Fab fragments and Rabbit anti-Calbindin-D28K. Wash 4x with block at room temp, >10 min each wash.
Incubate sections at 4 °C overnight in block containing 1: 1,000 dilution of anti-rabbit Alexa488 secondary, or other appropriate fluorescent secondary (available from Jackson Immunoresearch or Life Technologies). Note: Anti-Digoxigenin-AP, Fab fragments at 1: 1,000 can be added again if fear of losing signal from overnight wash.
Wash 4x with block at room temp, at least 10 min each wash.
Gradually replace block with detection buffer, a 50% exchange followed by 90% exchange of liquid in tube and then a subsequent 90% exchange. Dissolve a ready-to-use NBT/BCIP tablet in 10 ml of dH2O. Exchange detection buffer with NBT/BCIP solution and incubate in the dark without motion. Samples can be transferred from tubes to dishes for better color monitoring. Note: Purple precipitate can form in a few minutes, hours or left overnight at 4 °C depending on probe and expression levels of target. Once color spots in tissue sections are detected, replace NBT/BCIP solution with stop buffer. After development mount sections on slides and coverslip with Fluoromount-G.
mRNA in situ can be visualized with bright field or phase and immunostaining, Calbindin D28K can be seen by fluorescent microscopy. The images can then be overlayed using software: Photoshop, Image J, etc. Note: Alternatively, NBT/BCIP colormetric reaction can be replaced with a fluorescent substrate such as HNPP/Fast Red TR for double fluorescence detection. Isolate whole brain immediately from euthanized mouse and immerse in freshly prepared PFA. Incubate overnight at 4 °C nutating. Wash fixed brains twice for 5-10 min each in RNase free PBS to remove excess PFA. Vibratome section in RNase free PBS buffer, 50 µm each section. Transfer vibratome sections to either a 1.5 ml or a 5 ml Eppendorf tube, depending on amount of tissue sections used, and fill with PBS. Replace 50% of PBS with HPM (hydrogen peroxide in methanol to quench endogenous peroxidase activity) and mix. Replace as much of the mix with HPM. Incubate at room temp for 30 min nutating. Replace HPM gradually with RNase free PBS with a series of 25%, 50%, 100% volume exchanges for 1-2 min each. Replace PBS with DEPC block at room temp. Incubate for 10 min then replace with fresh DEPC block. Incubate free-floating sections at 4 °C overnight in DEPC block containing 1: 1,000 dilution of rat anti-CD68. Wash 4x with DEPC block at room temp, at least 10 min each wash.
Wash 2x with RNase free PBS to remove DEPC block, ~2-5min each wash. Fix with PFA for 30 min-1 h at room temp. Wash sections for 5 min, 2x in RNase free 5x SSC buffer to remove excess PFA. Incubate hybridized sections at 4 °C overnight in block containing 1: 1,000 dilution of anti-Digoxigenin-AP, Fab fragments and 1: 10,000 dilution of anti-rat HRP secondary. After developing sections with NBT/BCIP reaction switch to PBS then develop DAB reaction according to Sigma protocol for FAST DAB reaction. Note: Do not use metal enhancer, as the purple-blue from the NBT/BCIP reaction overlayed with the brown produced from the DAB reaction can produce a blackish color that can be masked by metal enhancement of DAB reaction, which yields a blue-black color. If NBT/BCIP reaction is expected to take a long time to develop, the DAB reaction may be performed first. Optimum conditions would have to be worked out for each experiment. After development sections were mounted on slides with Fluoromount-G and imaged with light microscopy. Alternatively, for double fluorescence microscopy applications, HNPP/Fast Red TR for AP reaction and Tyramide signal amplification (TSA) with Alexa Fluor dyes for HRP reaction can be used. Figure 1. Example result from procedure B. Immunostaining 1st, in situ 2nd. 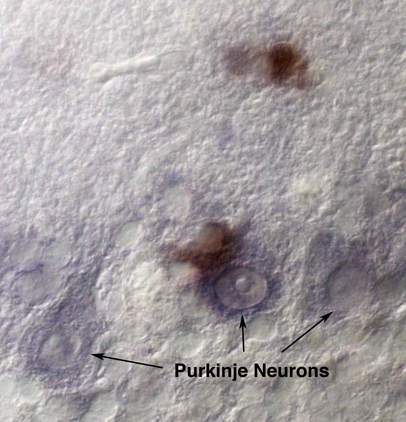 Image shows Purkinje neuron layer (cerebellar Purkinje neurons are identified by morphology) of a neurodegenerative disease mouse with anti-CD68 DAB staining (brown) and C1q mRNA NBT/BCIP staining (purple). In this image the C1q staining was underdeveloped and appears weak in order to demonstrate the distinct brown DAB staining. Images were taken using a Zeiss Axioplan II microscope. For additional representative data please see figures from the following Reference (Lopez et al., 2012). DEPC is a carcinogenic and should be handles with care. As an alternative to DEPC, an RNase inhibitor can be substituted. Some publications have described the use of 5 mg/ml sodium heparin to serve as an RNase inhibitor. See Cockwell et al. (1998). Caution: DEPC is toxic, use protection and proper disposal techniques. This protocol has been adapted from Lopez et al. (2012). Cockwell, P., Howie, A. J., Adu, D. and Savage, C. O. (1998). In situ analysis of C-C chemokine mRNA in human glomerulonephritis. Kidney Int 54(3): 827-836. Lopez, M. E., Klein, A. D. and Scott, M. P. (2012). Complement is dispensable for neurodegeneration in Niemann-Pick disease type C. J Neuroinflammation 9(1): 1-8. Navone, S. E., Marfia, G., Invernici, G., Cristini, S., Nava, S., Balbi, S., Sangiorgi, S., Ciusani, E., Bosutti, A., Alessandri, G., Slevin, M. and Parati, E. A. (2013). Isolation and expansion of human and mouse brain microvascular endothelial cells. Nat Protoc 8(9): 1680-1693. Stevens, B., Allen, N. J., Vazquez, L. E., Howell, G. R., Christopherson, K. S., Nouri, N., Micheva, K. D., Mehalow, A. K., Huberman, A. D., Stafford, B., Sher, A., Litke, A. M., Lambris, J. D., Smith, S. J., John, S. W. and Barres, B. A. (2007). The classical complement cascade mediates CNS synapse elimination. Cell 131(6): 1164-1178. Copyright: © 2014 The Authors; exclusive licensee Bio-protocol LLC. How to cite: Lopez, M. E. (2014). Combined in situ Hybridization/Immunohistochemistry (ISH/IH) on Free-floating Vibratome Tissue Sections. Bio-protocol 4(18): e1243. DOI: 10.21769/BioProtoc.1243.